My Time Tracker Free is a free Windows 8 time tracking app that lets you visualize and track how do you spend your time during the week. This time tracking app for Windows 8 organizes your time and helps you plan your tasks to get more time for yourself, throughout the week. 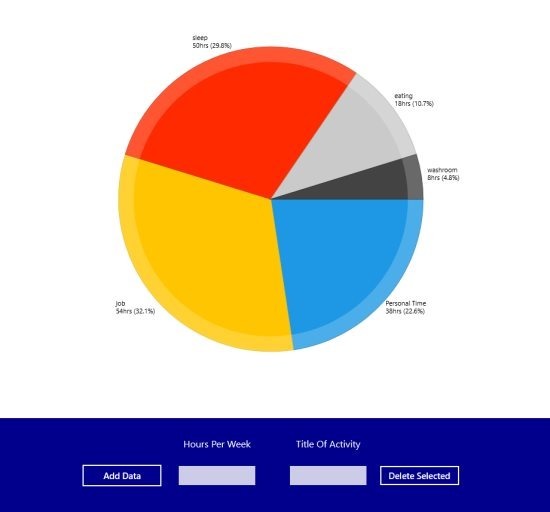 The app comes with a pie chart where you need to add hours your spend on various activities and save it. You can modify the hours you spend on activities, delete selected activities, etc. Go ahead and download My Time Tracker Free app for Windows 8 now. TimeCrunch is another time tracking Windows 8 app that allows you to track your time in case you work on various different projects. It gives you’re an easiest way to enter in your time and to get different ways to report on what you worked on. You can get reports by day, by project, summaries by month, by week, and the like. You can take a quick look on what all did you do during the whole month, or week. This Windows 8 time tracking app stores data, comes with restore / backup capability, lets you share your project with others using Windows 8’s Share Charm. As you open the app, you will find Start Your Day, End Your Day, and Daily Summary. 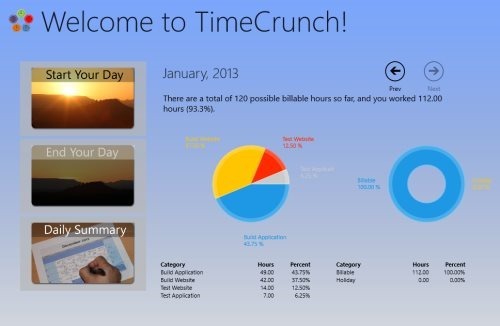 Go ahead and download TimeCrunch app in Windows 8 now. Ending my last post with this last but never the least time tracking app, iTimeTrack. This Windows 8 time tracker app allows you to track your time and your projects. You can start with creating a project along with allotting log time to the project. Time entries will track day of the entry, project you are logged to, a description or a short note, and time span of performing a task. You can easily track time span of multiple projects, see description, track time, keep your week organized so that you can take time out for yourself. Go ahead and download iTimeTack app in Windows 8 now.